From September 15 to 17, 2018, a meeting of the Sub-Commission on Energy and Climate Change of the Association of Regional Administrations of Northeast Asia, of which the Altai Territory is a member, was held in Taiyuan, Shanxi Province, People's Republic of China. The meeting of the Sub-Commission was devoted to the topic of low-carbon development - the energy revolution - in the context of climate change, deep processing of hydrocarbon raw materials, renewable energy sources, innovative approaches in the energy sector.The event was attended by representatives of 11 regional administrations from 4 countries (Republic of Korea, China, Mongolia, Russia). The event was attended by about 80 people, including Secretary-General of the Sub-Commission Hon Jong-ken, representatives of the Foreign Affairs Office of the People’s Government of Shanxi Province, the Administration of Taiyuan City, as well as delegations of the regions-members of ARASWA, specialists, representatives of business and academia. The Altai Territory was represented by the associate professor of the Faculty of Geography of the Altai State University, the scientific expert of the International Coordination Council “Our Common Home - Altai”, I.N. Rotanova, whose presentation was devoted to low-carbon energy in the regions of the Big Altai in the context of the Single Belt - One Way Development Strategy and adaptation to global climate change. The subcommittee also heard presentations by representatives of the Institute of Environmental Science and Engineering at Chang'an University (PRC), the Research Institute for Agricultural Environment and Sustainable Development of the Chinese Academy of Agricultural Sciences (PRC), the Development and Reform Committee of Shanxi Province (PRC), the Mining Corporation Coal of Jincheng Province, Shanxi Province (PRC). 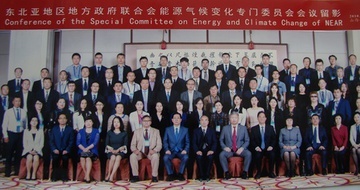 During the meeting, the subcommittee presented and discussed issues of adaptation to global warming on the example of measures that reduce the effects of high temperatures in Chinese cities, research of microbiological aerosols and high micro dust in China’s air, technologies with low energy consumption and low carbon emissions, economic efficiency of hydrocarbon processing raw materials, prospects for renewable energy. The meeting of the Sub-Commission ended with a visit to a steel mill in Taiyuan and a power station that supplies electricity to both Taiyuan and nearby settlements of Shanxi Province. On September 16, participants in the meeting of the Sub-Commission on Energy and Climate Change visited the exhibition of the energy industry Expo-Energy-2018, organized by the People’s Government of Shanxi Province. Shanxi Province is China’s largest coal industry region, thus playing an important role in the supply of energy resources in China. The province not only produces energy at modern power plants using innovative technologies, but also develops deep processing of hydrocarbon raw materials, contributes to the development of new renewable energy sources to improve the living conditions of the population. The participants of the meeting were invited to the opening and plenary meeting of the Taiyuan International Low Carbon Energy Development Forum (TELC). The main theme of the International Forum, which brought together representatives from more than 10 countries, was “Energy Revolution for the Benefit of Humanity”.The events held by the Association are aimed at organizing a practice-oriented dialogue on the most pressing issues and directions of the economy, ecology and culture, and promote the development of cooperation in order to strengthen interregional and international cooperation in the countries of North-East Asia.